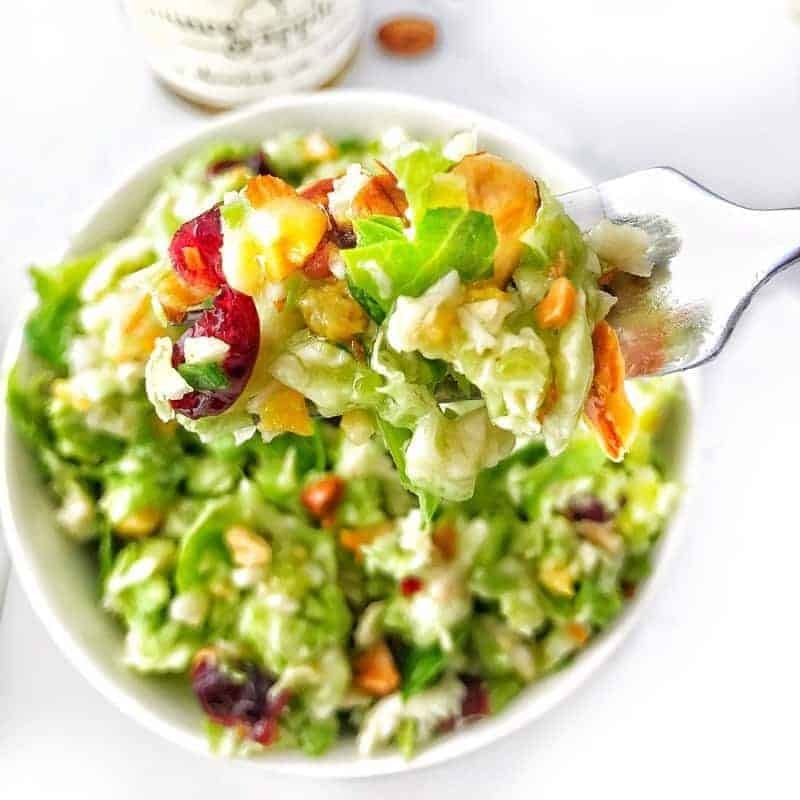 Shredded Brussels Sprout Salad with Cranberries & Almonds has a delightful light citrus flavor that blends perfectly with the sweetness of cranberries and crunch of almonds. It’s the perfect salad to bring to the next holiday or dinner party. Are you tired of lettuce salads that get soggy about 15 minutes after adding the dressing? Every holiday I eat leftover salad, only to be disappointed by how dismal each mushy bite is. Into the garbage it goes, along with the money spent on wasted ingredients. Today, I offer the solution to soggy salads. In the past few years, Brussels sprouts have become quite trendy. People are discovering that when prepared correctly these tiny cabbages are quite delicious. Their bad rap may have something to do with the quantity of over boiled Brussels sprouts that have been served over the course of history. These days you’ll find Brussels sprouts on the menus of trendy restaurants and on your grocer’s shelves in many different forms: fresh, shredded, or mixed with greens. 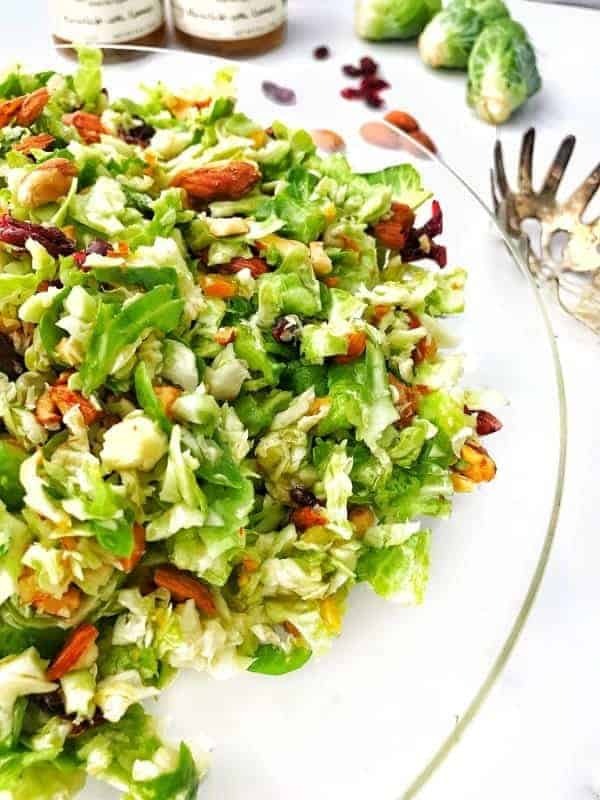 This Brussels sprout spring salad shows how versatile this misunderstood cabbage is. These little guys hold up to dressing without getting mushy, making it possible to bring a salad ready to serve -dressing and all – to your next gathering. Brussels Sprouts are the perfect salad base for many reasons. They are firm, don’t soak up dressing quickly like lettuce would, and are part of the nutritionally potent cruciferous family. Join Create Kids Club & get our 10 Favorite Crockpot Recipes ebook! Success! Now check your email to confirm your free membership. Orange Marmalade with Lemons pairs deliciously in this light, refreshing salad, and while I love this spread, feel free to use any marmalade you can find at your grocery store. This salad recipe vegetarian comes together in under 10 minutes. Pro Tip: You can add the dressing at home and don’t have to wait until right before serving. Roast in a 350-degree oven for about 15 minutes. For this salad, break up the almonds with a mallet. 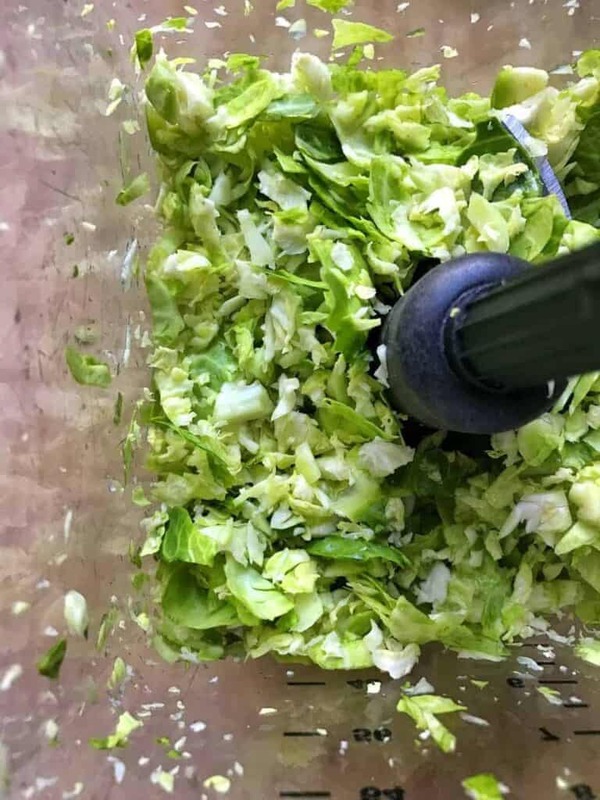 Kitchen Hack: Pick up a bag of pre-washed Brussels sprouts, cut the bottom end off, and toss them into a blender. Using the pulse button, pulse until you have chopped sprouts. This dressing contains just three ingredients oil, vinegar, and your favorite marmalade. Pour the ingredients into a glass jar with a lid, and shake it up and it’s ready to go. 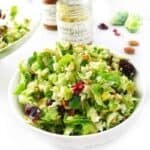 Shredded Brussels Sprout, Cranberry, & Roasted Almond Salad has a delightful light citrus flavor that blends perfectly with the sweetness of cranberries and crunch of almonds. 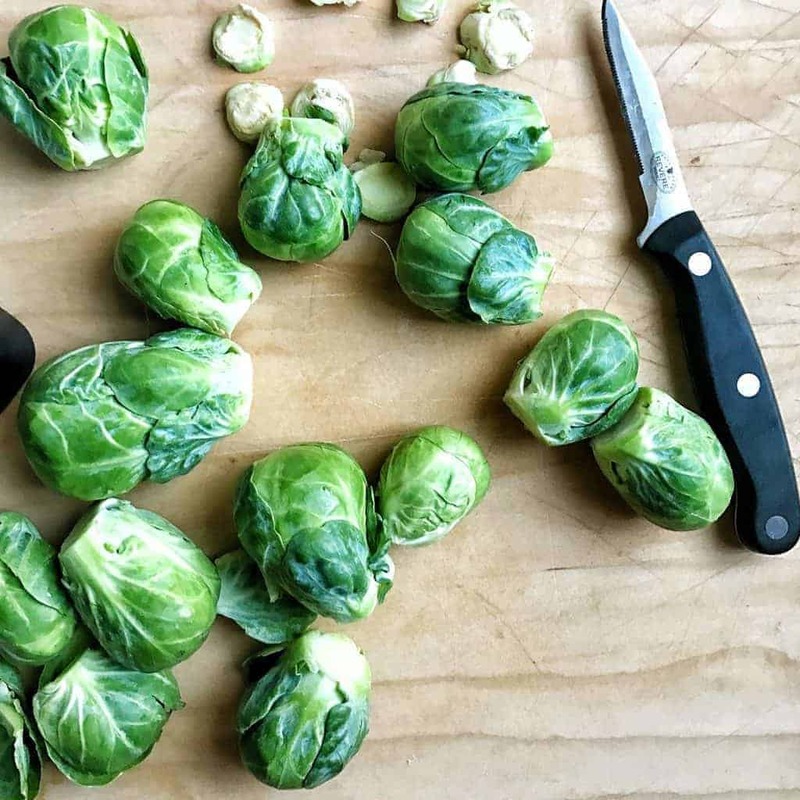 Slice ends off Brussels sprouts and place the whole sprout in a blender. Pulse until Brussels sprouts are chopped. 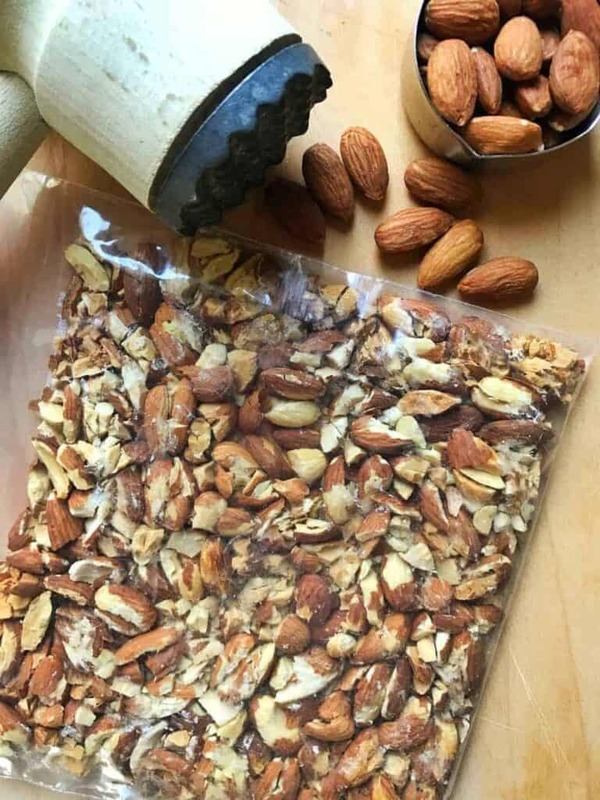 Place roasted almonds in a ziplock bag. Using a mallet or rolling pin, break into smaller pieces. In a medium sized mixing bowl, add chopped Brussels sprouts, dried cranberries, and almonds. In a glass jar with lid, combine oil, vinegar, and marmalade. Shake to blend. Store leftovers in a sealed container in the refrigerator for up to 2 days. I LOVE roasted brussels sprouts! I buy bags of the shredded sprouts at Trader Joe’s and roast them for salad toppings too. Next time I’ll have to try it uncooked in this delicious salad. That marmalade looks fantastic! A solution to soggy salads? Yes yes!! This is perfect. I am glad you agree, Abbey! I hate throwing food away! I love Brussels sprouts! Never tried them like this though. Brussels Sprouts are HEAVEN! Roasted… With olive oil and garlic – OHHH and then of course, SALT. LOTS OF IT! YUMMMM! I seriously can’t wait to make this! I can almost taste all those flavors and textures now! You will love it, Emily! Okay – I NEED this!! I LOVE Brussels sprouts!! I love brussels sprouts. That looks amazing! I’m not a huge fan of brussels sprouts, but don’t mind them raw in a salad like this. Looks good! It took me a while to get on board as well, Emily! I hope you enjoy the salad! This looks amazing! Love all of that color – and the fact that it won’t get soggy (that’s the worst!). I love salads, but yes, the sogginess leads to so much waste. I hope you enjoy! Jodi, I’m still trying to love Brussels sprouts, but this definitely looks like one to try. Thanks! Looks delicious and nutritious and it’s vegan friendly ? Thanks for the tips on how to quickly chop Brussels sprouts! Love this salad!